September 25, 2011 marked the close of the second annual Via Colori Street Painting Festival. 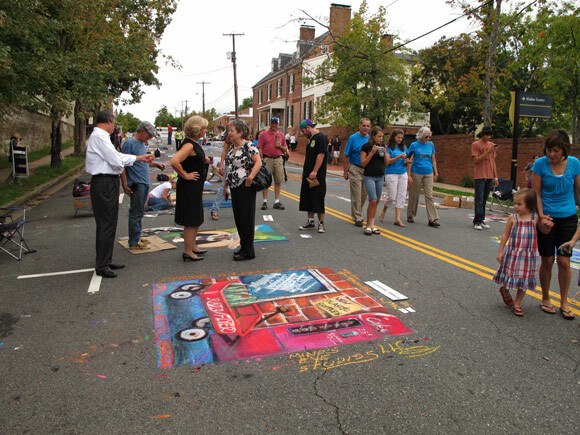 This event included over 50 volunteer artists creating large scale chalk paintings on the streets of Downtown Fredericksburg. The Via Colori Festival showcased master street painter Melanie Stimmell and 2011 signature artist Mirinda Reynolds. With the support of local sponsors, volunteers painted 4'x4', 6'x6', or 10'x10' squares. Congratulations to all participating artists, sponsors, and organizers of the event. View some of the work from the final day below.